I was commenting on Charlie Judy’s excellent post, “The Recruitfest Drive By Shooting” when I got the urge to write this post. The over-riding message I took from the 9 hours of Recruitfest streaming, and I watched it all, was that Recruiters and HR need to brush up on candidate care, and give a good candidate experience. It’s great that we have a conference streamed to 3000+ people. It’s great that we have an active twitter back channel that creates its own set of conversations. It’s great that I can phone in and speak to a presenter 1000′s of miles away and ask a question in real-time. It’s sad that we had to have that part of the conversation in the first place. To agree, communicate and stick to a timetable and method for feedback. To communicate “decline” decisions as soon as they are made. To give candidates constructive feedback. Not war and peace, but something they can work on in the future. It’s not rocket science, it’s not hard and its basic human decency. We can automate 80% of it. Lets cut the excuses. We shouldn’t need to waste the #Recruitfest opportunity (or any other conference/unconference including #tru,) talking about things we should really be doing. We should be talking about the future and how we can make the most of it. Talking about new developments and where they can fit in. Start thinking #BrandRecruiter and do the simple things to clean up our act! Be ambassadors for common sense good practice! Don’t make decency the exception. Like a lot of people, I was both excited and intrigued to see what Bullhorn were planning when I saw the announcement of the beta launch of Bullhorn Reach. I have been waiting for some time for one of the recruitment software providers to integrate social recruiting in to their standard offering. I was even more excited at the prospect of incorporating S.E.O. techniques for those like me, that are less than technically competent in these areas. I must point out that I am a big fan of Bullhorn both as a company and as a software provider. The current offering is always on my top 3 list whenever I’m asked about software for recruiters, it has great functionality, is easy to use and has lots of great add-ons that really improve the user experience. 17,000+ users worldwide tend to share this sentiment. I read the post and watched the video from Art Papas, the founder and CEO announcing the Beta launch. Cue much anticipation at a social media orientated recruitment software offering. I followed this up by watching the video from Phil Costa, Senior Director of Product Development on how Bullhorn Reach will work …. There are things I love about this new product, but a couple of key features that really don’t work for me. The profile function that creates your on-line profile in one new place is a great development that will promote users, and the SEO support that should position them up in the Google search rankings is fantastic. I’m less enthusiastic about the social media element that requires no human input and is entirely automated. The updates come out of the back-end of the software. This includes jobs, placements, links to posts, updates and other activity. The spider function that crawls the web to find relevent posts and material to automatically link to your profile, updates and social places means that users don’t need to even read posts they link to. This looks to me that what Bullhorn Reach creates for you is a bot at the end of your account, that requires no engagement, vetting, reading or responding on your part, it’s just a continuous stream of auto-posts. Where is the engagement bit or is this considered redundant? Where is the interaction on the accounts and streams, or the “personal” sharing behind the posts? Isn’t it this that makes Social Media, social? As I read it, there is no need for a recruiter to ever visit Facebook, Linked In or any of the social channels, the bot will do it for them. The technology is clever and the profiles with SEO a great idea, it just seems the social-media bit is anything but social. I would be delighted to be shown I’m wrong. I’ve only seen the video and based this post on that., I could be completely missing something. I have a great deal of time and respect for Art Papas and his team and that remains the same, but please tell me that this launch is more “social” than I see it. Is the “lost generation” a myth? I took part in the graduate recruiting track and the GenY track at #truManchester. My takeaway from the latter was the feedback from those that fit the stereotype by age, (and not the old people talking about them), was that they would rather not be boxed in to an age bracket definition which dictates what they are capable of and how they think. It is much the same as speculating that all Baby Boomers don’t understand technology and want a job for life. People are people and should be approached as such. The labeling is not helping either to integrate, and none of those present lived at home! You can read more about this at the great blog started by The Twintettes which outlines their view on this. My biggest eye-opener came in the Graduate Recruitment track. The story I heard was far from what I expected. Martin Edmondson from Graduates Yorkshire, commented that he knew of a number of larger companies that ran Grad Training Programmes that just couldn’t get enough applications. As a result, the programmes are still open when historically they would be long closed by now. This astounded me and was backed up by a few others who operate in the graduate recruitment market or hire graduates. All the headlines tell me we have a lost generation and that the situation for this years graduates is dire. Negative headlines and reports have led to a belief among students that there is no point. More positive headlines please that reflect reality! This year has seen the highest number of graduates taking up continuing education for another 1 – 2 years. This is because of the belief that there are no graduate opportunities and needing an alternative safe-haven for the next few years. Continuing education can be irrelevant and does not necessarily lead to greater employability, whilst increasing student debt. Theres a greater number of graduates taking extended “gap years” for travelling, believing there is no point sitting around unemployed as there are no opportunities. Poor links between graduate employers and graduates. Since #truManchester, I have been looking closer in to this by speaking with interns and graduates I’m connected with and others responsible for graduate recruitment. Theres seems to be a huge disconnect between university career departments and graduate employers. There is not a lot of confidence in either their capability to give real commercial advice or to co-ordinate entry in to the workplace. The top 10 – 20% of graduates that have been courted for some years or go to the right universities are fine, but what of the 80% that sit outside this bracket? The feedback I get is that University Careers Officers are well-intentioned but lacking in real life experience or reality. The upshot of this disconnect is where we are at now, where there are so many students out of work through apathy or access to opportunity, while graduate programmes are struggling to attract a sufficient volume of candidates to achieve the quality needed. I thought social media channels might provide the gateway that enables graduating students to connect with reality and find opportunity. After all, there’s lots of great advice out there in the twitter stream about how to find a job, and it is given freely. This is, after all the connected generation we are talking about! Just how many of those graduating at this time are active in social media? 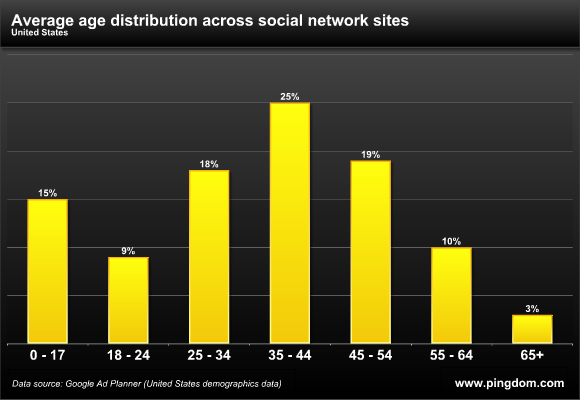 The lowest percentage of social media users in the USA (couldn’t find the UK figures) according to Google Ad planner is 18 – 24 with 9%. (kind of flies in the face of the Gen Y enabled generation theory.) I would imagine that the UK is not going to be dissimilar. There are some very good graduate communities and websites on-line. Graduates Yorkshire and Brave New talent are two that I’m very familiar with. That is great for those that belong to those communities or sign up, but what of those that are either unaware of the communities or just not using social-media in this way? When we conducted user research for the Oyster Partnership, the majority of younger users were in Facebook only (not twitter) and this was largely for social use and staying connected with a small group of friends. The feedback from #truManchester was that there is still major concerns over privacy which over ride a willingness to post personal detail to Facebook. Perhaps this is where the university career services need to be devoting their efforts, in converting a less than social generation in to using social media in the job search, and picking up on real opportunities rather than reading sensational headlines. I ran a quick search for graduate opportunities in the UK through the TwitterJobSearch engine that reads 120mn messages a day from 30 social sites and aggregates all the job posts in one place (It’s very neat!). This simple search shows that there are over 3,273 graduate trainee jobs posted to twitter today. Job aggregator 1job.co.uk are showing 6,282 jobs currently advertised on job boards and career sites. Jobsite alone have 326 jobs posted for graduate trainee specifically and 1480 jobs requiring either new graduates or graduate level entry candidates. It is a fair assumption that there may be many duplicates or agency postings amongst these figures, but that’s still a lot of opportunities at a time when we are reading the “lost generation” headlines each day. I’d like to see the careers advisors from the universities spending time on developing student skills in social-media and on-line in order to find jobs opportunities, track graduate employers and get the most of the application process. The students also share some responsibility in this. Whilst drafting this blog, I noticed a post from Wendy Jacob (who works in a university), airing her disappointment that come the end of term, the students just disappeared. While she works with the students (and no doubt puts plenty of personal time in), she doesn’t always get the follow-up or interest she deserves. You should read and comment on Wendy’s post. Could be that all the “No Jobs” and “Lost Generation” talk has caused many to give up before they have even started. I think more universities should employ the likes of Wendy, who have real recruiter experience. Her role is all about employability, everything we are talking about here. In my own experience in sourcing interns for clients from Universities, it has been a real mixed bag of experiences. I have had to really battle to get through the layers of career service and get to talk to someone who can do anything. We get there in the end, but if I was hiring for me, I’m not sure I wouldn’t have given up before I even started. Despite much talk, the universities seem disinterested to organise themselves to talk to potential employers who could provide the gateway in to work. I’d be interested in your views and experience in this area, and the best way to get the right graduates in to the right jobs. It seems that outside of some excellent on-line communities like Graduates Yorkshire and Brave New Talent, both parties are being poorly served. Most Sundays I join in with #blogchat. If you’re in my twitter stream, it goes out at 2.00a.m. and although it’s scheduled for an hour, can go on from anything up to 2 hours more. Despite the time, I feel as if I’ve been to blogging college, and hope it is reflected in my blogs. Some Sundays there can be as many as 500 contributors, and quite a few who genuinely deserve the term experts. Even if you are not around, and even if you’re not a regular blogger, you should check out the #blogchat twitter stream or download the transcript from www.WTHashtag.Com. It is well worth a read. Kudos to chat organiser and super blogger, @Mackcollier, who has a real willingness to share advice and answer the many @ messages. 1: Keep the blog clean and easy to read with an uncluttered side bar that makes it easy to connect. 3: Post either your latest posts or your most popular posts at the top of your sidebar. Attract readers to look around at past posts. 4: Use analytics to monitor page visits, bounce time (how long they stay), average posts looked at and subscribers. I use Alexa for this and have installed the toolbar that enables me to look at the stats on other blogs and benchmark. The stats do tell you a story. 5: Use extra-pages and drop downs to promote what you do. (You need a theme that allows this.) I have separated “About The recruiting Unblog” and “About @BillBoorman” and have increased the visits to these pages and enquiries for my services. 6: Sounds simple, but make posts easy to share with easy to find buttons. If your theme does not support the new WordPress share buttons, Add This is easy to install. 7: I’ve started registering my blog in the blog directories and it is driving relevent traffic. In a few, I’m the only recruiting/HR blog and this is driving new traffic. 8: I’m getting less random and more focussed in my posts. You would be the best people to give me feedback on if this is working. 9: Despite my early reservations, I’m trying to work to a posting schedule and get more consistent. Although I’ve not quite got the discipline in place yet, this will lead to posts being expected and build readership, and less reliant on driving traffic purely through social media. 10: Don’t need to say it, but unless the content is right, points 1 – 9 won’t make any difference what so ever. please let me know your views on my recent content, and just what you would like to see more of. PS: I’ve moved all links to the end of the post. I suggest you do the same or you run the risk of readers dropping off half way through a post! Thanks to our technology platform sponsors. After much asking, pleading,bullying, mentioning and twittering, the 2010 Video Edition of #HRCarnival is here. Thanks to everyone who contributed, sent out the message and made this possible. Lisa Scales from Talent On View who provided the technology. (Not only did Lisa provide the platform but she also spent christmas moving servers when her last provider fell over in order to ensure #HRCarnival could continue and for converting video submissions in various formats in to a format that can be posted here.) Thanks Lisa for all you have done! Thanks also to Shauna Moerke, better known as H.R.Minion for continuing to organise the project in the background, making sure there is always a host and plenty of content. Like lots of minions Shauna makes both the Carnival and #H.R.HappyHour happen without enough recognition. We appreciate all you do at making us all look good! You can continue to submit your video HERE for inclusion. For those without a webcam or too shy for camera, I have a solution that means you can take part. Send me a 4-5 slide power point presentation with your picture, thoughts for 2010 and contact details. We will do the rest to turn it in to video and include your thoughts in the 2010 #HRCarnival. To make things interesting I will be running 2 competitions each day. You can nominate a video of the day for Best Video and Best Message. At the end of the Carnival I will run the 5 video’s in each category that get the most votes. (1 vote per day in each category per person.) To vote leave your nomination in the comments section. The winning videos will be screened at #Trulondon 2 in February and the producer will win 2 tickets to a #TruEvent of their choice. You can choose from any of these events taking place globally in 2010 as well as the coveted title of #HRCarnival King/Queen. Thanks for being ambassadors of both your brand and our community in general. Send for the popcorn and enjoy the show! Video 1 is from Laurie Ruettimann, well known for her blog PunkRock H.R. and track leader for #trulondon2 in Feb.
Video 4 is from Raj Mennon who responded to a twitter post. Raj blogs on leadership on his blog 13 apples. A new one to me but now in the reader! Video 6 is from Andy Headworth. Another shot over the Christmas break hence the hat and the first signs of a beard. (Do you call that “Green Shoots?”) . Andy is an influential blogger in the U.K. through his blog Sirona Says, was a track leader at #trulondon 1 where he inspired at least 4 new blogs out of would be bloggers (me included), and is a track leader at #truLondon 2. Video 7 is from a recruiter known as the “Big Biller.” I refer of course to Jerry Albright who is often found (when not filling contracts, counting money or complaining about twitter) on most of the blogtalk radio shows. Jerry blogs at Jerry Albright, Staffing Artist where he also provides a range of downloadable resources free. Video 8 is a double-header from Michael Long and Kelly Mitton. Michael is well-known for always wearing red shoes running the red shoe project (send Michael pictures of red shoes!) Don’t ask, have a look, and blogs as TheRedRecruiter. Kelly has recently graduated from the University of Buffalo with a degree in business and a concentration in Human Resource Management. Kelly blogs on H.R, Gen Y (unusually from a Gen Y perspective) and other things on her blog tHRyving. Video 9 is from the recently announced top H.R. influencer (on line anyway) Mark Stelzner. Mark influences, among other places, through his must read blog Inflexion Point. Video 10: Last but not least is reserved for the real queen of #HRCarnival, Shauna Moerke. Shauna keeps things ticking over as well as co-hosting hugely popular blogtalk radio show #HRHappyHour. Looking at Shauna’s blog, HR Minion, she is currently between contracts so if you have an HR opportunity in or around Minnesota look her up. That ends today’s episode of #HRCarnival. We will be back tommorow with another 10 videos from the lucky dip that is my in box this year.. I hope you enjoyed these enough to come back. Why not save time looking for tweets and subscribe here for instant notification of the posting. Two other things to look out for during this carnival. On Monday I will be hosting 3 blogtalk radio shows to look at the predictions from the videos. These go out in Australia and New Zealand at 6.00am – 7.00am GMT (5,00 PM Aus/7.00PM NZ), in the U.K. at 12.00 – 1.00.P.M. and in the U.S. at 6.00 – 7.00 PM GMT (1.00 – 2.00 EST). I will be publishing the dial in numbers and show links tomorrow. Whilst we have H.R. attention on the Carnival, I will be publishing a special post for any H.R. or Recruiters currently job hunting. The story behind this is that I recently posted some detailed advice on another blog about how to promote yourself through social media. I’m going to reproduce these comments as a blog post and invite any H.R. professionals or Recruiters currently out of work to post links to their linked In profile or resume. Please take a look at the links and help if you can. Thanks for watching. Keep the entries coming. You can record direct or upload HERE. Be ambassadors of great HR/Recruiting! Where do i “live” again? What are we called then? This blog is written for H.R. Carnival. Those of you who are not familiar with the carnival, it’s a great concept started by @Beneubanks. The idea is that every few weeks there is a new host who reviews H.R. related blogs on mass and provides a great learning library. I hosted quite a few months back with my first ever hosted blog attempt. (It shows.) And it was recently hosted by @JonIngham from the U.K. Aside from that i’m not sure when it has last been posted this side of the pond. In the interest of giving more exposure to U.K. bloggers why not volunteer? you will find some great material in the process. Where do I live again? I’m a little bit confused because my community keeps changing. Not the physical one I live in, but the places I hang out on line, the people I talk to and the networks I take an active part in. The Recruiting Unconference London reflected this new community. 1/3rd of the attendees were Recruiters, 1/3rd Corporate Recruiters and H.R and the final 1/3rd consisted of technology vendors, consultants and job boards. This kind of split would be a fair reflection of my on-line networks, and I’m sure many are thinking the same. (Or am i the only odd one that doesn’t quite fit?). Historically, these networks (other than where there is a commercial interest) would have rather have crossed the road rather than be seen on the same street. The positive impacts of social media and personal branding has been a complete breakdown of these barriers and borders between disciplines. I’m sure this is because you get to know the person first before you find out too closely what they do. As someone who has traditionally been very much a third-party recruiter, I have probably communicated with more H.R. professionals over the last 6 months than I have in the preceding 26 years on anything other than a sales basis. This convergence of expertise, knowledge and individual focus can only be a good thing. It has certainly changed my outlook and thinking in some areas considerably, and I hope I have made my own contributions to the neighboring professional networks. I’m really looking forward to openly sharing in the future, much as we did at the unconference , without fear or suspicion between disciplines. We might have different objectives but we face many of the same issues and challenges and collectively we can find the best way to move recruiting forward for the benefit of all. We are all now one community combined (tagged Social Human Convergence at #trulondon). The challenge for me is to find new ways to collaborate and put this combined expertise to good use. I’m sure between us we can prove to be quite a force to human related problems, particularly when you consider that the opinions are global. Have a look at who is posting in the carnival. Not traditional H.R. Twitter is a great leveler and a real indication of where your brand stands. The reality is that some people like you and value your comments, some people don’t. The instant feedback element is part of what i like about the channel, as well as the opportunity to enter in to conversation and get feedback quickly. As twitter, and twitter use has evolved then the conversations and relationships on and off line have got closer and some real business relationships have been formed. When i spoke in Dallas at #Talentnetlive and at Recruitfest09 in Toronto, it was noticeably different that 80% of the delegates knew me or about me on some level without ever having met me. This is how social media has really changed the way we network. Of recent, I’ve started following all the news from conferences worldwide. A recent blog by @HRMargo highlighted this, how twitter has enabled her to feel a part of many conferences that she would otherwise have been either excluded by budget/location or knowledge that it was taking place, the learning was exclusive to the lucky few who attended. I have recently organized #trulondon quite a low budget. The marketing has been almost exclusively via twitter, using the #trulondon hash tag and a wide number of blogs written about the event and we have managed to attract 12 top names in social recruiting as track leaders including Geoff Webb (@radicalrecruit) from Canada. This level of international marketing would have taken years and many thousands of pounds/dollars pre twitter. We all have our own views on how to build an effective following and maintain it. For me it is about conversation, contribution, helping where you can and sharing. For me, i make a regular habit of promoting my followers within my network and passing on links that i think might be interesting. I do this by retweeting links that interest me that i think could interest my network. I also retweet jobs in social recruiting that i see because i know that some of my followers are actively looking now and they may have missed it. My network is also international with about 70% of my followers being based out of the UK, and as a result i like to promote UK bloggers that I’m interested in and vice-a-versa. Through social media (and skype) the world is a shrinking place, and there is lots to be learnt from all cultures and recruiting markets. I see this as probably the biggest benefit of being involved in social networks, bigger than the business and brand opportunity is the self-development that comes from this instant library of bloggers and advisors in my twitter stream. If i like it, i want to share it. There we come to the nature of twitter. Some people will simply not like your style, personality, volume or any number of other things. With a big following you can’t please everyone or you become pretty sterile, and how far away is changing your image from being unauthentic? The same people that talk brand image equally talk authenticity and originality. My advice is that consistency is the key, retaining a distinctive style. With nearly 3000 followers it seems to work o.k. for me. in the process i will lose some followers. without wishing to sound arrogant about it, i would invite anyone that does not like my style to unfollow, it’s really quite easy. That for me is one of the appeals of twitter, you choose who you want to follow and who you don’t, exercise that choice. What prompted this blog was the comments from Peter Gold on a blog i wrote quite a few months ago in another group. Rather than be upset by this, it got me thinking about the comments, should i change how i tweet or continue as i do for the reasons outlined? i actually apreciate people being open and critical, even when they clearly have not read the full blog and subsequent comments. My conclusion is what is outlined at the start of this entry. I may well have a long way to go, we all do and if my followers were decreasing i might be concerned but thats the beauty of twitter, if you don’t like what i do, don’t follow me or put me on your list. we all have that sanction and long may it continue. To everyone in my network please retweet often. send anything you think might be interesting, i welcolme it and thank you for sharing. By sharing and engaging with your followers, and promoting others as well as yourself you build a trusted and valued network. What are your thoughts on the best way to build a following and the value of a retweet? A great discussion for the social media circus track on Thursday. comment freely, i have broad shoulders. What is all this “Un” stuff? The unblog is the official blog of The Recruiting Unconference London (if anything can be official about such an event!). This is the place for random thinking on recruiting and social recruiting, debate and discussion. In the spirit of the unconference, anyone can post here on any topic, start their own blog or leave comments. The comments are unmoderated, it is down to you to respect common decency just as it will be on the 19th November. All you need to do is register and start blogging. Word, video, podcast, whatever method you favour, post it here. A what & a why you might be asking. What is an unconference & why Norton Folgate? (unless you are full of madness, you probably won’t know the answer to either. An unconference is an unconventional event that has built momentum from the technology sector in the states. From barcamps to gatherings in parks, the unconference is seen as the best way to share and communicate and come up with real solutions without the clutter of structure or set agendas. Its also an ante-dote to attending a traditional conference, knowing half the speakers already and paying £3 – 400 to see one of them. There are no rules or fixed structures, speakers or auditoriums, and definitely NO death by powerpoint. The event is broken in to tracks with trackleaders in most cases, who have some expertise in the discussion area. Their role is to encourage conversation, input where needed and support the exchange of ideas, communication, conversation, disagreement, debate and discussion. Anyone can join in and if you get bored, you just change the conversation or move to another track. I lead a track at Recruitfest09 in Toronto and this great event convinced me that we needed to do the same thing in London. Norton Folgate is the name I’ve given the blog for The Recruiting Unconference London or #trulondon if you live on twitter. I mention Madness, or the nutty boys for two reasons. Firstly they are by far the best band ever, and second, their recent (and excellent) album is titled “The liberty of Norton Folgate.” The release of the album drew my attention to the history of a part of London that was was named Norton Folgate, tucked between Whitechapel and the Bishopsgate. (The quest for the venue starts on the location of the Norton Folgate then head east from Mr.Truemans beer factory via the gas lights). The area was declared by statute a liberty i:e: A free land with no rules or order. Being a liberty, it attracted all of Londons society and became home to the artists, poets, performers, artistes, free thinkers, buskers, anarchists and the like. You might expect anarchy without order but the story , as the song goes saw a society spring up where people accepted each other, helped and shared views without the need for law and agenda, the people in effect policed and organised themselves. The liberty of Norton Folgate may have been forgotten in time but for Madness, reviving it in song and retelling the story. By some strange chance, and in an event eerily unconnected with the band, property developers planned to pull down the alleys and buildings that form Norton Folgate and replace them with functional but faceless glass skyscrapers to match most of the surrounding areas. Norton Folgate seemed doomed forever when local protest met a brick wall of bureaucracy. By chance, a local historian opposed to the destruction of this piece of history found the Liberty and discovered that by error, the beaureaucrats had never actually revoked it. By evoking the Liberty, and declaring that the land did in fact belong to the people and not the planners, the demolition has been prevented at least for the time being. At the same time, Madness had read about Norton Folgate and had written a series of songs on London, culminating in a 10 minute classic celebrating the Liberty. The protesters, on hearing this, adopted the song as their anthem and the two movements combined. Madness, being a bit rebellious (but nice), in their day were honoured that their musical mischief making had coincided with such a rebellious event! On my part, the spirit of Norton Folgate is exactly what the Recruiting Unconference London is all about. No set rules or structure, self policing, the tracks and controlling the content. We are expecting enjoyment, engagement, laughter, a little anger and plenty of learning. I view it that as The Bill Boorman Consultancy is the name above the door, it’s our job to facilitate the event, it’s the job of every attendee to organise it and make sure that the content is just right for them. You choose what you want to know, what you want to talk about, where you want to contribute and where you want to listen. Then just like in Norton Folgate, the evening will end in revelry. The Recruiting Tweetup is a quarterly event organised by Jamie Leonard of The Ladders and Matt Alder of Penna Barkers, the social media ringmaster himself. The London RTU brings your networking offline and enables you to put faces to the tweets whilst enjoying the odd ale, liquor or similar exotic tipple. The London RTU is the place where the debate will no doubt continue long in to the night fuelled by intoxication. A great end to a great day! The Recruiting Unconference London or #trulondon takes place on the 19th November.